The Premier League is one of the most popular sporting leagues in the world and has attracted supporters from all walks of life. Hollywood too has been caught up in the football frenzy and the most popular league in the world continues to draw celebrities towards it, because of its flair and fierce competition. Both football and Hollywood have the source of much entertainment in the 21st century and will continue to do so in the foreseeable future. Hollywood stars, much like us, have their favourites and are often spotted at stadiums displaying their support for their favourite club. The Gunners, who are currently 2nd on the league table, have had a solid campaign so far. Arsene Wenger’s summer signing Shkodran Mustafi has been a big success and has not yet lost a single match that he has played in. Alexis Sanchez as the central striker has worked wonders and the player is currently the top scorer in the league. However, danger looms ahead as Sanchez’s and Ozil’s contract situation is still unclear. The club will definitely have to reach some kind of a middle ground if they are to keep their two best players. Arsenal’s dominance historically has ensured a huge supporter base for the club, including some famous Hollywood stars. Kevin Costner – The actor/director was spotted in London in 2014, where he revealed that he was an Arsenal fan. The star was shooting the movie “Criminal” and admitted his love for the club. Costner became a fan of the Gunners after seeing the team play some great football at Highbury. Idris Elba – The Englishman, who is reportedly next in line to play James Bond, has on several occasions professed his love for the Gunners. Elba has also expressed his disdain for Chelsea and Spurs. In an interview with BBC, Elba once said that he’d be physically sick if Spurs won the Premier League title. Spike Lee – The American director is not only a big name in Hollywood but he is also the director and writer of NBA 2K16. 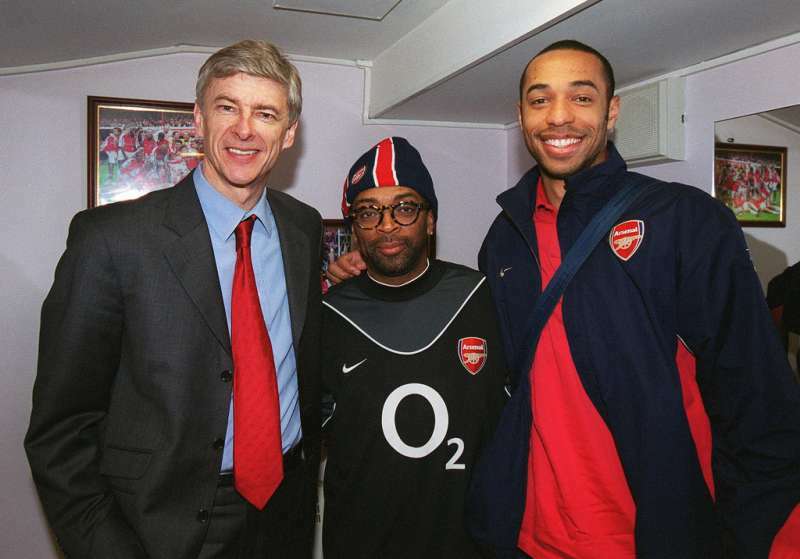 Lee was pictured in an Arsenal shirt with Henry and Wenger back in 2004.